It is a generally accepted story that an ancient South American Inca tribe called the Quechua first made jerky (“ch’arki”) as early as the 1500’s. Halal Mummified Jerky blows that theory away, where it is well documented that jerky was made thousands of years ago by ancient Egyptians. Archaeologists made this discovery when they found dried foods preserved in tombs. Tutankhamen, King Tut had about 40 boxes of meat and poultry in his tomb. Halal Mummified Jerky is 100% made in the USA, and their beef is certified to be halal by Halal Transactions of Omaha. 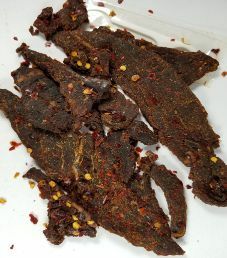 Halal Mummified Jerky is distributed by Timeline Trading, and they are located in Bellevue, Washington. 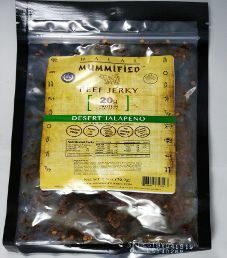 The next review on Halal Mummified Jerky will be on a 2.5 ounce/70 gram bag of their Desert Jalapeno flavored halal beef jerky. This will be the second review on this Desert Jalapeno flavor, where the flavor name has since changed, and the bag design has been tweaked. Halal means food that is allowed for consumption under Islamic dietary guidelines. The aim is for a Muslim to slaughter the animal, limiting the amount of pain the animal will endure. The jerky bag was kindly submitted for review by the owner Ahmed Kamel. The liquid marinade here consists of a decent soy sauce, a not so good Worcestershire sauce, water, and a liquid natural hickory smoke. It is disappointing to see that the unhealthy sweetener high fructose corn syrup (HFCS) is used in the Worcestershire sauce to lose a rating. The spiciness is achieved from the jalapeno powder, crushed red chili peppers, and cayenne powder. Hot peppers are healthy if eaten in moderation, which flush toxins out of the body. The sugar level is respectable at 2 grams of sugar per 28 grams of jerky. The salt level is on the lower side at 240mg of salt per 28 grams of jerky. This jerky qualifies to have no sodium nitrite, or any other similar unhealthy preservative. Instead, salt is the main preservative used. To a lesser degree citric acid acts as a preservative. With more kudos to Halal Mummified Jerky, this jerky has no MSG added. 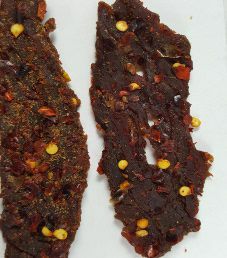 These strips of jerky are mainly medium in size, and sliced to a medium thickness. The texture is in between soft and dry, and requires a reasonable effort to chew. The fragrance of this jerky is primarily the Worcestershire sauce and crushed red chili peppers. The first flavor detected, albeit at a light level is the great taste of Jalapeno. That is quickly followed by a light sweetness, a light level of salt, a good level of black pepper, and a decent ratio of Worcestershire/soy sauce. 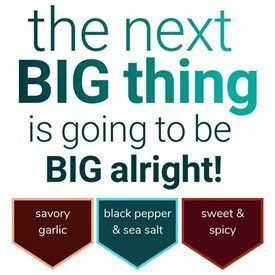 Before you know it, the heat from the cayenne pepper, jalapeno powder, and especially the crushed chili peppers starts to dominate big time. As you consume more strips, the heat level increases to the point where your mouth is burning. On a heat scale, this Desert Jalapeno flavor levels out at a solid 3 out of 5, perhaps even higher. Jalapeno flavors are typically mildly spicy, but that is certainly not the case here, where arguably this flavor is too hot tasting. Stéphane found this flavor to be way too hot for a jalapeno flavor, and specifically because of the crushed red chili peppers. I mostly agree with Paul here, but this flavor could stand to perhaps have a little more sweetness to counteract the heat. A splash of vinegar would help to add a little acidity. If hot tasty jerky is your preference, you are bound to enjoy this Desert Jalapeno flavor. Taking all three of our our taste ratings into account, we have awarded this flavor a Good (8/10) taste rating. A 2.5 ounce/70.9 gram bag of jerky sells online for $7.99, which works out to $3.20 an ounce. That would rate as an expensive price. This resealable plastic bag has a label affixed to the front, and nothing on the back. 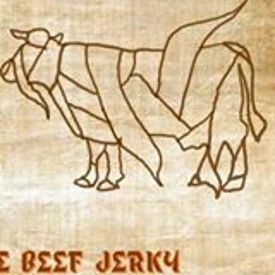 The Halal Mummified Jerky logo is a cow wrapped up as a mummy. Random hieroglyphics line the vertical borders of this label. There are no slogans printed on this bag. Some facts printed on this bag are “Natural Smoke Flavor Added”, “Gluten Free”, “Premium Halal Blood Drained Meats”, “No Added Nitrates or Nitrites”, “No Added MSG”, “Made in USA”, and “Premium Halal Blood Drained Meats”. The only missing bag category are soy and wheat allergen alerts. A halal certified symbol is printed on the bag.